These vendors were visible in many parts of Metro Manila, often situated in strategic locations that will offer the best opportunities for footfall (or in our case, traffic jams). The majority of vendors we saw were selling fruits and vegetables, their stalls either filled with brightly coloured fruits of all shapes and sizes, or were selling large quantities of one item. Other popular goods for street vendors include manufactured products, clothing, stationary, and offering grooming services. For our team, we bought boiled corn on the cob from one seller, and rambutan (an edible fruit) from another. Their produce was fresh, but also cheap, and mainly sold by women (and in some instances, children). 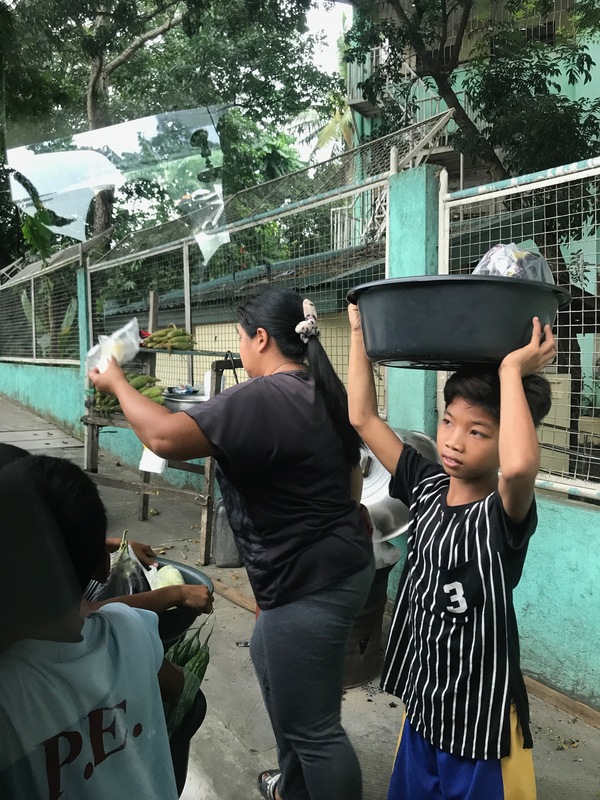 This short blog post explores the literature relating to this vibrant part of the informal economy of Manila. For the purpose of this blog, we do not include organised illegal businesses such as drug trade, human trafficking, or prostitution; but rather we focus on food vendors, as this was our experience of street vendors in the city. As indicated elsewhere on this site, the informal economy is a vital part of each of our cities society, sitting alongside formal economic activities and trading procedures for centuries. This is particularly the case in areas of the Global South where the growing rural to urban migration patterns, and lack of formal sector jobs mean that the informal economy is growing as individuals seek to establish viable livelihoods (Milgram, 2011). Street vending, the topic of this blog, has been defined as a service where goods are offered “for sale to the public without having a permanent built up structure from which to sell” (Bhowmik, 2005: 2256). Street vending is often the subject of academic enquiry as it presents an interesting intersection between public space, economy activities, and temporalities. The latter is significant as street vending is not often practiced in the same way as professional trading, but rather is seasonal, or often occasional if it serves as an additional income generator for families. It also provides a valuable service for the urban poor as it provides food and goods for a lower price.It can also be fixed in space, mobile (moving from space to space), or continuously mobile (where items are sold on the move, or on transportation). Street vendors therefore provide difficulties for city planners, as the informal and temporal use of space is seen as outwith the ordinary useage, and therefore is difficult to predict or control. For this reason, it is often viewed as illegal, with action often taken against them. For example, in some areas of Metro Manila, officials previously sprayed their goods with kerosene to cause the goods to be unsaleable (Bhowmik, 2005). Although, as with all industries, there are differences at the local level, with some areas better able to work alongside officials than others- particularly where the informal economy is viewed as a boost for the local area than a deficit. This framing of the informal economy is likely to affect how policies around this phenomenon are delivered. Despite the prominence of street vendors in urban areas, these individuals face a series of interconnected issues, as explored in a qualitative study of street vendors in the Calcoon city area of Metro Manila (Recio and Gomez, 2013). This study described three concerns of street vendors: physical/spatial concerns; socio-economic concerns; and legal concerns. In terms of spatial issues, there were concerns of vendors slowing down traffic and pedestrian flow through the streets. Street food vendors are also not able to access piped water, and are often rendered illegal on health grounds (Bhowmik, 2005). Given the often seasonal nature of the work, many described monetary issues, describing short term loans or use of loan sharks to provide a short term solution to long-term financial loss. Finally, given the lack of recognition of street vendors, the local government do not administer permits, or investigate concerns facing vendors regarding safety. This creates vulnerabilities for the vendors, who may be vulnerable to fines or prosecution in areas that privilege formal sector work over informal sector vendors. This insecurity and vulnerability may lead to vendors seeking security through under the table payments to the policy, or organising individual arrangements with store owners for a pitch outside their premises (Milgram, 2011). Milgram (2014) argues that these negotiations provide insight into the intersection of different forms of power, between vendors and city, and also between different vendors. In terms of the latter, she highlights the importance of looking at the gender differences of street vendors in terms of how they negotiate their visibility and vulnerability in the informal economy and in public spaces, particularly regarding unionising.